Dr Gorka Mercero, Lecturer in Basque Studies, attended the XVII Forum for Iberian Studies from 29-30 September, which was hosted by the Faculty of Medieval and Modern Languages at the University of Oxford. In this short Q+A, Gorka tells us about the conference and his contribution to it. So Gorka, what was the conference about? Overall, the conference discussed the crisis in the Iberian peninsula and its repercussions on contemporary cultural production, especially in literature and the arts. To give more context, Spain is undergoing a turbulent period, due to the global financial crisis of 2008, but also due to a manifold political crisis that seems far from reaching an end and that involves a range of destabilizing issues, from institutional corruption to geopolitical conflict. The ongoing pro-independence process in Catalonia is on the verge of changing radically the history of the Spanish state and is currently the clearest symptom that Spain never completed fully its formation as a nation-state. Were there any papers that impressed you particularly? A couple of the keynote speakers in the conference, such as Dr Joseba Gabilondo or Dr Helena Miguélez-Carballeira, devoted their papers to an analysis and critique of the centralist and homogenizing ideology that still pursues the goal of a uniform Spain and ignores long-held claims for the recognition of its internal national differences. What was your contribution to the conference? The context for my paper was the notion that the Basque country is another focus of nationalist conflict within the Spanish state. My contribution engaged with Dr Gabilondo’s suggestion that Basque literature has reached a ‘postnational’ stage. Thus, according to Dr Gabilondo, Basque literature has finally overcome the need to create a ‘national allegory’, namely an empowering image to represent the Basques to the rest of the world. On the contrary, I suggested that the need for such a representation is still as intense as ever, but has reached the point where Basque national identity – probably as any other in this age of globalization – has to be redefined by a radical opening to other identities that sets no clear limits between them anymore. Iberian and Latin American Week (IBLAW) has become an established part of the annual calendar for IBLAS staff and students. Originally formulated as a celebration of Iberian and Latin American cultures aimed at students, last year we made a deliberate decision to expand it beyond the University and held events in different locations around the city, including the Central Library and the Small Cinema. This year, the activities will be in collaboration with the newly formed Americas Studies Network (ASN), a multidisciplinary network that aims to bring together experts in the study of the Americas. This year’s theme is Fronte(i)ras (boundaries/borders). As well as activities for students, such as translation and interpreting workshops, a Galician language taster, and a chance to learn about the lyrics of cumbia, a musical style originating in the Caribbean and popular all over Latin America, we will have plenty for the general public. Some of the highlights this year include a workshop and performance by artist in residence Sebastian H-W, who will be here working on a new script of his full length show Chokolatul. This is a work that responds to the colonial, religious and linguistic influence of chocolate-making in Iberian society and its wider impact throughout European culture. As part of his residency and in collaboration with engage@Liverpool ,Sebastian H-W will give a one day practical cross-culinary workshop with students exploring his research methodology and process. There will also be two film screenings, one on campus of Yagé is Our Life (Neil White, 2016), and another in the Small Cinema of Sleep Dealer (Alex Rivera, 2008). Yagé is Our Life is a film about the indigenous people of Putumayo, Colombia, their relationship with Yagé (more widely known as the mind-altering herbal drink Ayahuasca), and their perceptions on the commercialisation of their traditional medicine. Sleep Dealer is a science fiction film set in the near future and imagines a world where the Mexican-US border is completely closed and Mexican workers carry out labour in the US using remote-controlled machinery and drones. Following the screening, there will be a roundtable to discuss what the film has to say in the light of the proposals by the US Republican candidate Donald Trump that, if successful, he will build a wall between the two countries. The event takes place just a week before the US presidential election and should lead to a lively discussion. Further events include talks on Basque culture and music, and Portuguese-Brazilian writing. There will also be a chance to practice your moves on the dancefloor, with a Salsa class with some departmental experts, and a performance by the Catalan group, Janksy, in The Caledonia. The week concludes with the Peer’s Symposium, at which the significance of Fronte(i)ras in film, literature, music and digital cultures from the Luso-Hispanic world will be discussed. Join us next week to learn more about the Hispanic and Lusophone world! The full programme is available here. 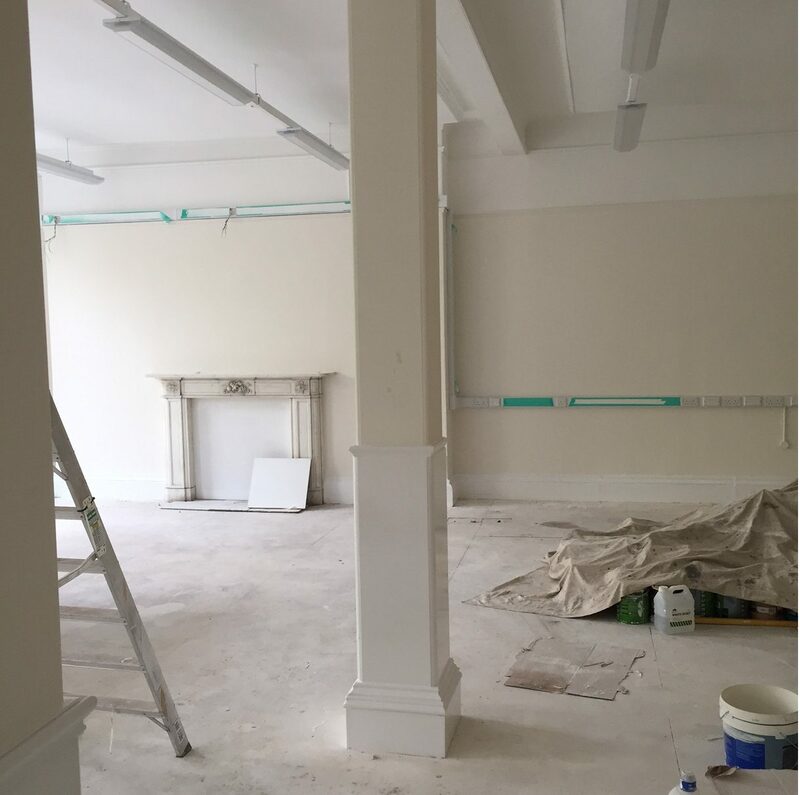 Work is well underway on the University’s new home for Modern Languages & Cultures. After decades in the Cypress Building, the department is due to move to a new home early in 2017. 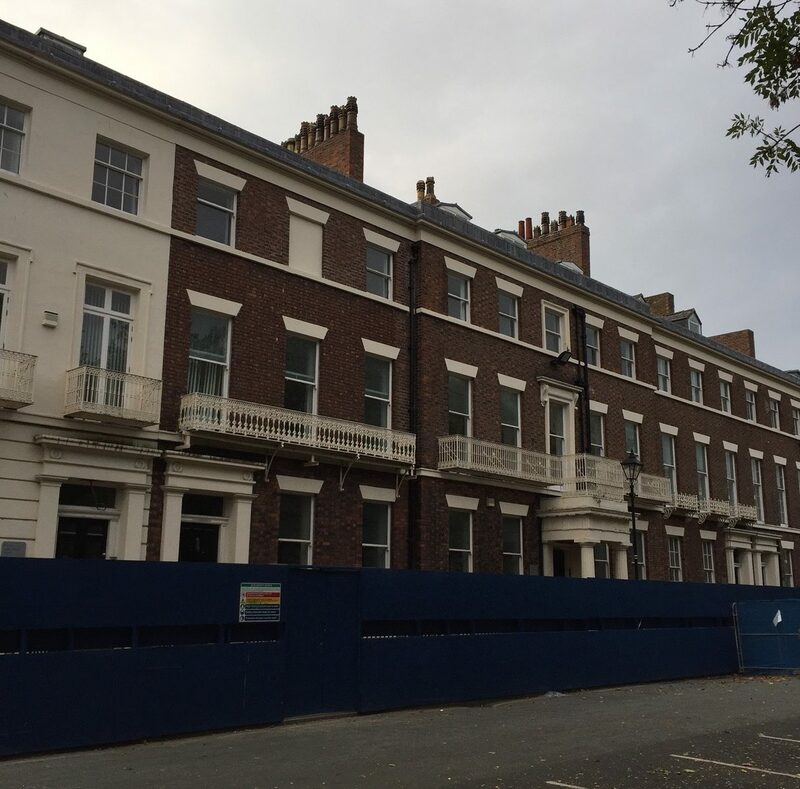 With the redevelopment of three sides of Abercromby Square completed (first the Sydney Jones Library, then the School of the Arts, and most recently 8-12 Abercromby Square, which houses the departments of History, Archaeology, Classics, Egyptology, and Politics), the final terrace to be renovated is numbers 1-7. Once finished, Modern Languages & Cultures will join Irish Studies, and the English Language Centre, making Abercromby Square the heart of arts and humanities at the University of Liverpool. Modern Languages & Cultures will occupy the south end of the terrace, with the English Language Centre in the middle, and Irish Studies returning to its former home at the north side of the square. The main reception for all three departments will be on the ground floor, where there will also be offices for the Faculty of Humanities & Social Sciences, including the Executive Pro-Vice Chancellor, Professor Fiona Beveridge. On the first floor, the University has made a significant investment to create a Languages Centre, which should be the first port of call for all members of the University – staff and students – interested in language learning. International students on a pre-sessional English-language course will rub shoulders with Modern Languages undergraduates and those students electing to study a language as part of the University’s portfolio of co-curricular options. Language-learning resources will be located in this Languages Centre. Staff from Modern Languages & Cultures will vacate their offices in the Cypress Building in the New Year, moving to the first and second floors of the new premises. On the third floor, there is to be ample space for postgraduate students in shared offices. The department is very excited about this new chapter in the life of Modern Languages & Cultures at the University. You’ve met our new languages assistants in French, German and Italian. Today, we introduce our three new colleagues in Spanish, Rafael Morillo, Marina Zamora and Raquel Gómez, who will be contributing to Spanish language teaching at all levels. I have just finished an MA in Education, having previously completed a degree in English Studies and Literature, both at the University of Sevilla. I am currently enjoying the great opportunity I received from the University of Liverpool, which has provided me with my first experience as a university language tutor. I believe that education is the main foundation of any given society, and I am glad to be part of such a vibrant department. From the very first time I visited Liverpool two years ago, I felt perfectly at home in this city. I love the atmosphere in the city centre and I especially love a peaceful walk along the docks. During my time here, I want to develop my skills and knowledge as a teacher of my mother tongue, as well as learn more about a city that wins your heart and surrounds you with a magical atmosphere of music and history. I completed a degree in Hispanic Studies at the University of Salamanca in 2013 and, since then, I have completed two postgraduate diplomas: one of them also at the University of Salamanca in teaching Spanish literature and language in high schools (for native Spanish speakers), and the other one in teaching Spanish as a foreign language at the University of Sevilla. From 2014-15, I had the chance to work as a language assistant in a sixth form college in Manchester for a year. It was a great experience that made me discover my interest in teaching my own language. I see the opportunity of teaching at the University of Liverpool as an essential new experience in my training, as well as a chance to help improve my English and to explore this exciting and vibrant city. I am 24 years old and originally from Barcelona, although I moved to Galicia at the age of 14. Due to this fact, I have had the chance not only to learn two beautiful languages, Catalan and Galician, but also to broaden my knowledge of the different cultures that can be found in Spain. In 2014, I graduated from the University of Santiago de Compostela with a degree in English Language and Literature and, last year, I decided to apply for the position of Lectora de español at the University of Liverpool as I knew it would be an enriching experience. This is a great opportunity to enhance my teaching abilities and improve my linguistic skills, whilst getting to know more about British culture. Sophie Murray BA (2016, French) crossed the Pennines to come to Liverpool and is another of our very recent graduates to take up employment in France. As a Single Honours French student, Sophie was able to take a wide range of different modules in the department, and enjoyed the literature and cultural topics in particular. Sophie is one of the Department’s students who spent her year abroad working on an independent work placement. She was an intern in a real estate agency in Nice, and made such an impression on her employers that, at the end of her placement, the company offered her a post on graduation. The internship during the year abroad was devoted to sales training and building up her experience. In her spare time she travelled around the region, completely falling in love with Nice and the Côte d’Azur. Liverpool for me was an amazing experience. The city is so full of life and culture – and proper nice restaurants – and I met some incredible people. Back in Nice, Sophie’s job is, in her words, exciting, stressful and rewarding. She is an independent agent so there is a lot of pressure on a daily basis, but she finds it fulfilling to be able to find people their dream property. She meets a wide range of people, and she especially enjoys having British clients and being able to help them through the complicated French system. In terms of using the skills she acquired in Liverpool, Sophie spends a lot of her working day on the telephone, making enquiries and negotiating between buyers and sellers. On some days, she visits properties, either with clients or to establish sales contracts. This includes photographing properties and preparing advertising texts. Sophie is increasingly becoming an expert in French administrative processes and procedures – but the perfect tonic is the ability to head to the beach and enjoy the Mediterranean. A monthly series of film screenings linking academic research areas in the University of Liverpool’s Department of Modern Languages with rarely-shown Spanish, Portuguese and Latin American films opened on Thursday 13 October at Liverpool Small Cinema on Victoria Street. The first film to be screened was También la lluvia (Even the Rain, 2010), introduced by Dr Şizen Yiacoup, Lecturer in Hispanic Studies, who also led a Q+A session after the screening. Here, Dr Yiacoup tells us a bit more about the film and the event in our own Q+A. So Şizen, what’s the film about? The film is by Spanish director Icíar Bollaín and tells the story of Mexican director Sebastián (played by Gael García Bernal) and executive producer Costa (Luís Tosar), who travel to Bolivia to shoot a film depicting Christopher Columbus’s conquest of the New World. Sebastián and Costa unexpectedly find themselves in the middle of a moral and political crisis when they and their crew arrive at Cochabamba, Bolivia, during the intensifying 2000 Cochabamba Water War, which their key native actor, Daniel (Juan Carlos Aduviri) persistently leads. How does your research relate to the film? My research and teaching focus on cultural exchange and conflict between Jews, Muslims and Christians in the medieval and early modern Hispanic world. In the Q+A session, we discussed several topics, including the reasons behind Columbus’s first voyage to the New World, the ongoing marginalisation of indigenous peoples in the present day, and the privatisation of national services and industry in Latin America as well as in Britain. Having an understanding of the problematic process of political unification and internal colonisation which took place in Spain and the ways in which these drove the Spanish imperial project in the New World allows us a much deeper insight into the problems that have troubled Latin American society ever since. The ways in which the control of natural resources and human labour were sought and imposed in the colonial period manifest themselves repeatedly in the modern era through issues such as land rights, the privatisation of water, and access to decent housing, health care and education for marginalised groups, namely indigenous peoples. How did the Q+A session go? I’m really delighted that there was such a strong turnout for the film and that so many people in the audience stayed for the Q&A session, which was incredibly lively and thought-provoking. A very big thank you to everyone who contributed towards making it such a fantastic and interesting evening. ‘IBLAS Talks Film’ continues on 3 November, when Dr Niamh Thornton, a specialist in Mexican film, literature and digital culture introduces Alex Rivera’s 2008 production Sleep Dealer. For more information, go to http://liverpoolsmallcinema.org.uk/events. French and German are not the only two language sections to see the arrival of new members of staff this academic year. Today, we welcome Federica Sturani, who has returned to the University of Liverpool to teach Italian. I am delighted to rejoin MLC, and to become part of such a dynamic team in Italian, which was awarded a 100% student satisfaction rate in the most recent NSS. I hope that my contribution to the team will help to maintain such a high standard! I am returning to the University of Liverpool after 3 years, during which I have been involved in different projects, including a collaboration with local primary and secondary schools on the teaching of Italian, and a new Italian workbook, published by Hodder & Stoughton and entitled Italian Tutor: Grammar and Vocabulary Workbook. The text was published in April 2016 and is a grammar workbook aimed at post-beginners and intermediate learners. The main idea behind the project was to fill a gap in current learning resources for intermediate students of Italian, a stage in language acquisition that is particularly difficult to target. This explains the relative paucity of textbooks building up on basic competencies, and I hope that Italian Tutor will be welcomed by all teachers as a stepping stone towards mastering Italian. I love teaching Italian, and this will be my main contribution to the team this year. However, I will also be involved in a number of events and projects aimed at providing extra-curricular opportunities for students of Italian. Language acquisition is central to what we do in the Department, but fluency in languages other than English allows our students to access culturally fascinating worlds which add novel perspectives on the human experience. I believe that a passion for other languages and cultures should be fostered early on in life and cultivated over the years, and so I am keen to use my experience to support activities such as liaising with schools and other outreach events. Buon anno accademico a tutti! On Thursday 6 October, the School of Histories, Languages and Cultures (HLC) hosted a public lecture in conjunction with the Chilean Embassy on Sir Ernest Shackleton‘s ‘Endurance’ expedition, marking the centenary of the rescue of Shackleton’s crew by the Chilean navy. The Chilean Ambassador to the UK, Señor Rolando Drago Rodríguez, was joined by a delegation also comprising Mr Maximiliano Valdés, Second Secretary to the Ambassador, and Captain Mr Ronald Baasch Barberis, Defence and Naval Attaché. The delegation was welcomed to the university by, amongst others, the Vice-Chancellor, Professor Janet Beer, the Head of HLC, Professor Lin Foxhall, and the Head of the Department of Modern Languages and Cultures (MLC), Professor Matthew Philpotts. Colleagues from MLC were also in attendance, as were members of the public and members of the Angl0-Chilean Society living in Liverpool, with whom Señor Drago chatted enthusiastically as he got to know more about Liverpool’s Chilean population. The lecture was given by Professor Fernando Wilson from the Universidad Adolfo Ibáñez in Chile, and sought to highlight the role played by Captain Luís Pardo Villalón, or ‘Piloto Pardo’, commander of the Chilean steam tug Yelcho, in the rescue of 22 members of Shackleton’s crew from the barren, uninhabited Elephant Island after their ship had sunk (surviving on penguin and sea lion meat!). Having unsuccessfully made rescue attempts himself, Shackleton turned to the Chilean navy, which sent Piloto Pardo and the Yelcho to successfully complete the rescue mission, eventually returning to Valparaíso to a hero’s welcome. The lecture was followed by a Q+A session, during which Professor Wilson elaborated on the links between Piloto Pardo and Liverpool, where Pardo served as Chilean Consul from 1930–34, having retired from the navy in 1919 after being showered with medals and naval honours. The Q+A session was itself followed by a wine reception (Chilean wine of course), kindly sponsored by the Chilean Embassy, which facilitated further conversation and discussion. The new academic year sees many of our students begin their Year Abroad. Today, we catch up with Liam Beddall, a student of Modern European Languages, who is splitting his Year Abroad between France and Germany. The English Centre des Hautes Falaises – The Beatles are everywhere! Whether you’re a prospective or current student of modern languages, the Year Abroad stands out as one of the most exciting aspects of your degree. A new country, culture, social life and working environment all piece together to immerse you into ‘the great unknown’. As part of my Year Abroad, I have moved to the coastal town of Fécamp, in France, where I am working at The English Centre des Hautes Falaises, which offers English language tuition for children and adults. I will be spending six months here, before moving to Göttingen, Germany in April 2017 to complete a university placement. Having been in Fécamp for just over a week, I have already had the opportunity to partake in a variety of activities that have put my language skills to the test. Working at The English Centre has thus far been a fantastic experience (and one I would wholeheartedly recommend for next year’s students). The family-like camaraderie that the centre promotes makes the work here extremely gratifying. On the first day, I felt like I had been thrown in at the deep end, but I have had the opportunity to work with children and adults with varying levels of English, all of whom have been very welcoming and willing to learn. Every day has been different and offered new challenges, both in the classroom and in the administration of the centre. I am having to use a plethora of skills, which I know will prove extremely valuable to prospective employers. In my short time here so far, I have learnt that if there is a question, the answer is normally ‘yes’. Try the foods you don’t like, go to the places you wouldn’t normally go to and do the things you wouldn’t normally do – it’s all part of the experience. Aside from working at the centre, I’ve been extremely lucky to be living with a very friendly French family of six. Not only has this helped improve my language skills immensely already, but it has also opened my eyes to new cultural experiences. I have been lucky enough to dine with people from different cultures, go on a guided tour of local stained glass windows, explore an abandoned WWII German hospital, sit in on a viva for a PhD on Astrophysics, and even meet the Mayoress of Fécamp! From 8–10 September 2016, German language lecturers Veronika Koeper-Saul and Anke Bohm attended a meeting of the European University Tandem (EuniTa) Erasmus+ project in Florence. In this short Q+A, they tell us a bit about the project and the outcomes of the meeting. Basically, EuniTa is like our ‘Conversation Exchange’, where language learners are matched up with native speakers of the language they are learning so that each can learn from each other. This Erasmus+ project uses the concept to create an electronic exchange platform geared at university students. Who is creating this platform? It’s a co-operation between seven European universities: the University of Liverpool, the University of Exeter, the Université de Poitiers, the Université Paris Sorbonne, the Universitat Blaquerna Ramon Lull Barcelona, the Università degli Studi Firenze, and the Goethe University Frankfurt. How will the platform work? Visually, imagine a cross between Facebook and Skype, with a timeline, video and messaging facilities, and the added bonus of language learning materials, support and even certification. To start an exchange, we’ll have an automatic matching system based on self-declared student details such as native and target languages and preferences such as whether the age or university subject is important to you. What are your specific contributions to the project so far? We have already created graded conversation guides on the topics of ‘Health and Sports’ and ‘Daily Life’, which will be uploaded to the platform. The language levels are labelled according to the Common European Framework of Reference for Languages (A1 to C2), so if you are really into these topics you can have more and more advanced conversations about topics from the same categories and clearly see your progress. There will be lots of other topics, too, of course, created by our partners and sifted by ourselves. Following discussions in Florence, we will now format our materials to a common design, add media such as pictures and videos, and prepare further specialist conversation guides for students of science and health subjects. The idea here is to help students of medicine or life sciences, for example, prepare for the kind of speaking required on a study abroad period or even give papers at conferences. Very soon we will also select some Liverpool students to test the platform and then help remedy any problems that might crop up. For more information on undergraduate and postgraduate study of languages and film at the University of Liverpool, please visit the Modern Languages and Cultures website. This blog ran from 2011-2017. Our new departmental blog can be found here. Out with the old, in with the new (blog)! Parla.cat – Learn Catalan online!